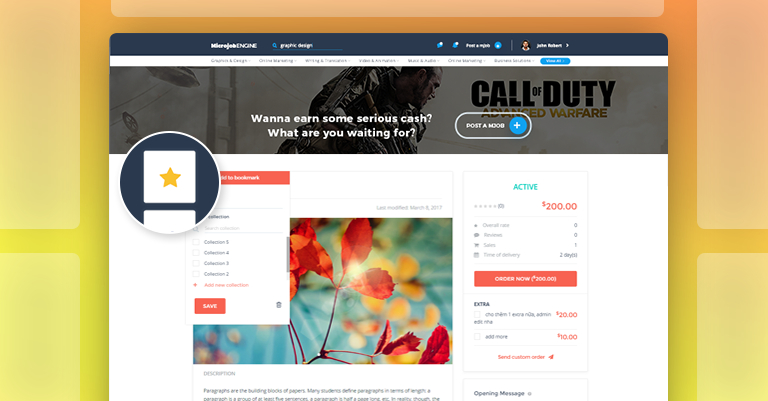 Tomorrow is MicrojobEngine 1st birthday. As promised in our post 2 months ago, today we’re happy to announce the release of MjE Bookmark extension. 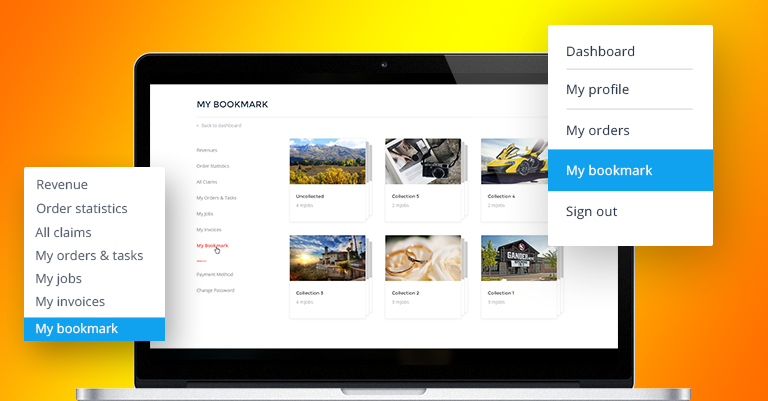 There’s nothing so big about this extension, we just want to give your users a handy tool to easily save their favorite items, creating a better and more joyful user experience. P/s: Please note that the MjE Bookmark requires MicrojobEngine 1.3.1+ and PHP 5.6 to function properly. 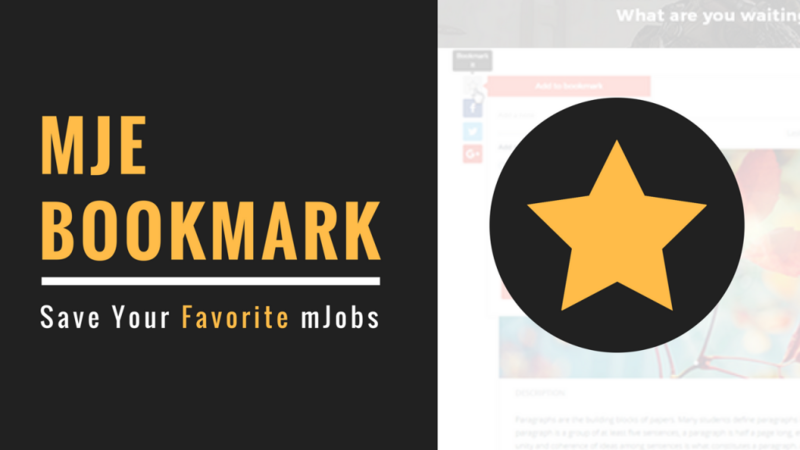 Let’s take a look at MjE Bookmark extension. You’re only 2 clicks away from saving any items: Click on the star icon to bookmark an item. A pop up shows up for users to choose the collections in which they want to put the item, but they can hit the button “Save” right away and choose the collections later. Add note to bookmarks: When clicking on the star icon to bookmark an item, there’s a space for users to add note for later review. Remove bookmarks at any time: Users can easily remove any item from their bookmark list. Click again on the Star icon, hit the Trash icon to remove the item. Think of the folders on your computer. Having too many files in just one place sometimes becomes a total mess when you can’t find out the file you need. So categorization is necessary. This is the same for bookmarks. Organizing bookmarks in different collections would save time for users to quickly find what they need. When bookmarking an item, a popup will appear, users can conveniently add a new collection. To view all collections, choose “My bookmark” section on the top right menu under account name in homepage. At first, a user created a collection and named it as “Design”. But then, he wants to change to “Flat design”. This can be done in seconds. Click “Edit”, adjust the name and click Save. In case your users wish to delete a collection, click the Trash icon beside the collection title to complete the action. *Note: “Uncollected” collection can’t be renamed. It’s the default collection created in the system. Yes, an item is not limited to only 1 collection but can be saved in many collections at the same time. Bookmarks can be moved among different collections. Fast and easy! When a user bookmarks an item but hasn’t saved it to any specific collections, that item is automatically saved in Uncollected. Users can go to this bookmark and move to other collections later. When the original item has new changes in content or status (active, paused, archived, etc. ), those changes are automatically updated in other places storing that item. So, if that item is in your bookmark collection, then it’s auto updated as well. Very convenient to keep up to date with the latest information. 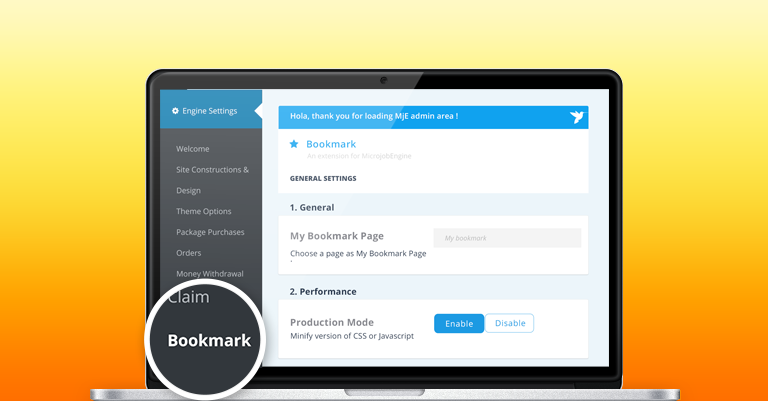 In the back-end, once Bookmark extension is activated, you’ll see Bookmark section under Engine Settings, click on it to access Bookmark settings. Settings for this extension is quite simple. Bookmark page: When Bookmark is activated, a bookmark page is auto created and named as “My bookmark”. However, if you wish to choose another page to display as Bookmark page, go to “Pages” section, open “My bookmark” page, copy the shortcode of this page [mje_my_bookmark] and then paste to the page you want to replace. Collections per page: This is where you will set the number of collections displayed on 1 page. The default value is 2. Recent bookmarks per page: Each collection has 2 tabs: All and Recent. The former shows all bookmarks in the collection, while the latter lists the most recent ones. So in this field, you can set the number of most recent bookmarks to display in “Recent” tab. The default value is 1. Our world has so many different beautiful languages. So do our customers’ websites. Not all websites use English, so we have input texts of Bookmark extension in a file for you to translate to your own language. We have checked this translation method, it’s very convenient and easy to use. Watch this video to learn how it works.